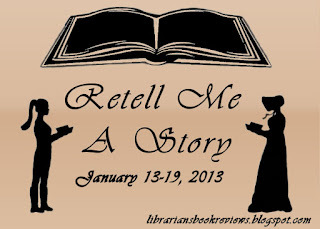 One Librarian's Book Reviews: Retell Me a Story: Welcome and Giveaway! Retell Me a Story: Welcome and Giveaway! Retell Me a Story, Coming This Sunday! Back in November 2011, I began to notice that there seemed to be an upswing of retellings hitting my radar. And not just fairy tale retellings, which are always available. No, there were more classic books and mythological stories making a fresh appearance. I've always been a big fan of classics, though I've really neglected reading them of late. I was really excited to see these often loathed classic books wearing shiny new faces that might actually attract new readers. Thus, my idea for a reading challenge, the Classic Double Challenge, was born. This challenge encourages people to read a retelling (or otherwise related book) and its "classic" predecessor. It is my way of encouraging myself and others to not only enjoy those fancy new retellings, but give some love to those dusty older classics as well. And from there I thought, why not have an entire week dedicated to celebrating retellings? I'm hoping this celebration will light the fire under you to read not only a retelling, but also the original story that was its inspiration. Awesome topic and thanks for offering the giveaway!